Once you have become familiar with the Alerts widgets, you might see the need to integrate the alerts with an existing system like Nagios, instead of relying on emails for getting notified. This is where the Custom actions come in. A Custom action is a way to execute a script on the hub whenever an alert is triggered or cleared, as well as when a reminder happens (if set). The script will receive a set of parameters containing the state of the alert, and can do practically anything with this information. Typically, it is used to integrate with other alerting or monitoring systems like PagerDuty or Nagios. Any scripting language may be used, as long as the hub has an interpreter for it. The Custom action script gets called with one parameter: the path to a file with a set of KEY=VALUE lines. Most of the keys are common for all alerts, but some additional keys are defined based on the alert type, as shown below. These keys are present for all alert types. ALERT_NAME Name, as defined in when creating the alert (string). ALERT_SEVERITY Severity, as selected when creating the alert (string). ALERT_LAST_CHECK Last time alert state was checked (Unix epoch timestamp). ALERT_LAST_EVENT_TIME Last time the alert created an event log entry (Unix epoch timestamp). ALERT_LAST_STATUS_CHANGE Last time alert changed from triggered to cleared or the other way around (Unix epoch timestamp). ALERT_STATUS Current status, either 'fail' (triggered) or 'success' (cleared). ALERT_FAILED_HOST Number of hosts currently triggered on (number). ALERT_TOTAL_HOST Number of hosts defined for (number). ALERT_CONDITION_NAME Condition name, as defined when creating the alert (string). ALERT_CONDITION_DESCRIPTION Condition description, as defined when creating the alert (string). ALERT_CONDITION_TYPE Type, as selected when creating the alert. Can be 'policy', 'inventory', or 'softwareupdate'. In addition to the common keys, the following keys are present when ALERT_CONDITION_TYPE='policy'. ALERT_POLICY_CONDITION_FILTERBY Policy object to filter by, as selected when creating the alert. Can be 'bundlename', 'promiser' or 'promisees'. ALERT_POLICY_CONDITION_FILTERITEMNAME Name of the policy object to filter by, as defined when creating the alert (string). ALERT_POLICY_CONDITION_PROMISEHANDLE Promise handle to filter by, as defined when creating the alert (string). ALERT_POLICY_CONDITION_PROMISEOUTCOME Promise outcome to filter by, as selected when creating the alert. Can be either 'KEPT', 'REPAIRED' or 'NOTKEPT'. In addition to the common keys, the following keys are present when ALERT_CONDITION_TYPE='inventory'. ALERT_INVENTORY_CONDITION_FILTER_$(ATTRIBUTE_NAME) The name of the attribute as selected when creating the alert is part of the key (expanded), while the value set when creating is the value (e.g. ALERT_INVENTORY_CONDITION_FILTER_ARCHITECTURE='x86_64'). ALERT_INVENTORY_CONDITION_FILTER_$(ATTRIBUTE_NAME)_CONDITION The name of the attribute as selected when creating the alert is part of the key (expanded), while the value is the comparison operator selected. Can be 'ILIKE' (matches), 'NOT ILIKE' (doesn't match), '=' (is), '!=' (is not), '<', '>'. ... There will be pairs of key=value for each attribute name defined in the alert. In addition to the common keys, the following keys are present when ALERT_CONDITION_TYPE='softwareupdate'. ALERT_SOFTWARE_UPDATE_CONDITION_PATCHNAME The name of the package, as defined when creating the alert, or empty if undefined (string). ALERT_SOFTWARE_UPDATE_CONDITION_PATCHARCHITECTURE The architecture of the package, as defined when creating the alert, or empty if undefined (string). Given an alert that triggers on a policy bundle being not kept (failed), the following is example content of the file being provided as an argument to a Custom action script. When you get this to work as expected on the commmand line, you are ready to upload the script to the Mission Portal, as outlined below. 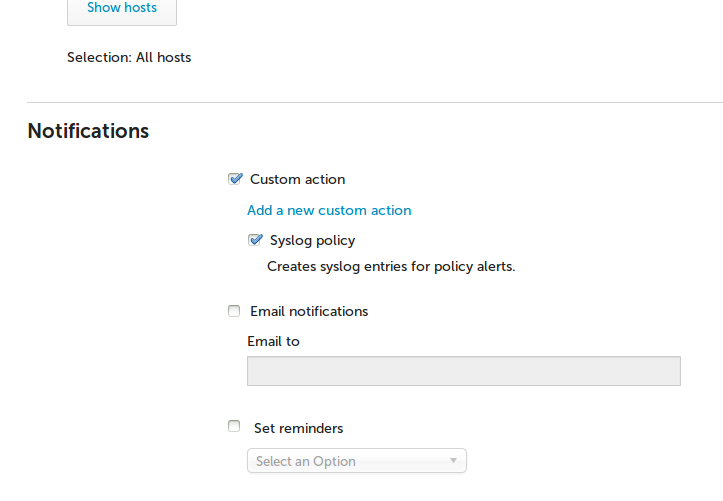 The following Custom action script will log the status and definition of a policy alert to syslog. logger -i "error: CFEngine Custom action script $0 triggered by non-policy alert type"
logger -i "Policy alert '$ALERT_NAME' $ALERT_STATUS. Now triggered on $ALERT_FAILED_HOST hosts. Defined with $ALERT_POLICY_CONDITION_FILTERBY='$ALERT_POLICY_CONDITION_FILTERITEMNAME', promise handle '$ALERT_POLICY_CONDITION_PROMISEHANDLE' and outcome $ALERT_POLICY_CONDITION_PROMISEOUTCOME"
Members of the admin role can manage Custom action scripts in the Mission Portal settings. A new script can be uploaded, together with a name and description, which will be shown when creating the alerts. Alerts can have any number of Custom action scripts as well as an email notification associated with them. This can be configured during alert creation. Note that for security reasons, only members of the admin role may associate alerts with Custom action scripts. Conversely, several alerts may be associated with the same Custom action script. When the alert changes state from triggered to cleared, or the other way around, the script will run. The script will also run if the alert remains in triggered state and there are reminders set for the alert notifications.